In Southwestern Spain, multifunctional silvopastoral systems consisting of pastureland and open oak woodlands are known as Dehesas. These, and other similar systems of the Mediterranean basin, are currently threatened by increasing intensive land use. As a consequence, oak regeneration is declining and is in need of adequate management and active restoration. Traditional restoration practices outplant one-year-old, nursery-produced oak seedlings grown in 250–350 cm3 containers, but establishment and growth results are typically poor. This work examines holm oak (Quercus ilex L. subsp. ballota (Desf.) Samp.) grown in a non-conventional container size (24 l) and age (6–7 years) with three mulch treatments (control, stone, and straw). In an open Dehesa of SE Spain, 106 oak saplings were planted in March 2010, and survival, diameter at breast height (DBH), and leaf-nutrient concentrations were analyzed. Forty months after planting, all treatments showed high survival (81 %) but only straw-mulched saplings differed significantly (94 %) from control (74 %). DBH increased over time but showed no significant differences among mulch treatments. Saplings with high initial DBH showed the greatest growth and change in DBH at the end of the study period. Leaf-nutrient concentrations changed significantly in the year following outplanting. Bi-monthly foliar nutrient concentration data show decreases in P, K, Zn, and B and sharp increases in Ca and Fe. 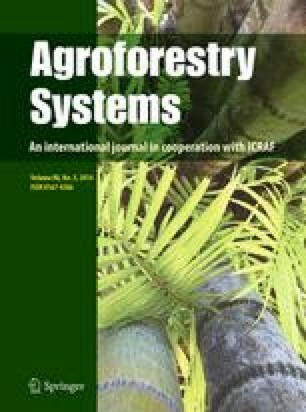 In this work, we provide some evidence concerning the viability of non-conventional oak size for restoring, regenerating, or building up new agroforestry or silvopastoral systems. A combination of saplings with more than 10 mm of DBH and straw mulch is recommended. The online version of this article (doi: 10.1007/s10457-014-9737-y) contains supplementary material, which is available to authorized users. We thank the Environmental Council (Junta de Andalucía) for financial support provided by Convenio de Colaboración no. 372 and the members of the Forest Management for Conservation research group (PAIDI AGR-245) from the IFAPA and EEZ-CSIC for their invaluable assistance. M.N. Jiménez and A. Sánchez-Miranda were sponsored by the Operating Programme of the European Social Found for Andalucía (2007–2013). We thank David Nesbitt and R. Kasten Dumroese for assistance with English revisions.